Encountering a snake, whether it’s in your backyard or out in the wilderness, can be a dangerous situation. Snakes can be found virtually anywhere, even in a suburban neighborhood. Attempting to move a snake without the proper tools can lead to significant injury. If the snake is venomous, it can even prove to be life threatening. Luckily, there are safe and humane options to relocate or move a snake without any issues. Snake tongs make it possible to control a snake without ever having to a lay a hand on it. A long pole creates a safe distance from the head of the creature, acting as a second arm to lift or drag it away. These poles will keep the snake out of striking distance. Controllable jaws at the end of the grabber will keep a firm and gentle grasp of the body, making it possible to lift the snake up with ease. Having some tongs is imperative when handling snakes, but not every tool is made the same. Some designs are better suited for specific tasks and snake species, so which model do you go with? 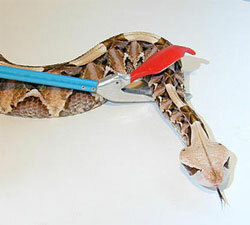 Here are the top 5 snake tongs for handling snakes. These tongs are built with strength and durability in mind. Made for the outdoors, they are constructed with aircraft-quality cast aluminum. The pole is made from an anodized aluminum. These materials ensure that the tongs don’t bend or break even with a heavy snake. They use a thin Pilstrom-style jaw. The jaws are coated in red for increased visibility. This coating is softer to prevent injury to the snake and slippage. 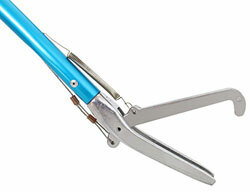 The tongs have a pistol grip that’s comfortable to use and enhances control while lifting and moving the snake. It’s available in a range of sizes from 24 inches up to 72 inches. With a length of 60 inches, these tongs are great for finding and capturing snakes in the brush. Despite its length, the tool is very durable. It’s made from stainless steel tubing. Every component from the handle to the cable mechanism is built to last. It uses a thin scissor jaw configuration. The unique aspect of these tongs is their ability to come apart. The tongs come in two separate pieces, which makes it easy to transport. The two pieces come together and secure to create a strong foundation for handling any type of snake. The handle also uses a pistol-style grip and controls. From Gentle Giant is this high-quality tool made from aircraft grade aluminum. The tube pole conceals the stainless steel cable that operates the jaw. In total, the tongs measure 52 inches long. The jaws are wide enough to support heavy snakes. They measure roughly 2 1/4-inches wide. The top jaw is coated in rubber three times. This creates a secure and comfortable hold onto the snake’s body. The bottom jaw is completely polished and smooth. This helps to inhibit the snake’s movement forward. The tongs are clad in blue and red, which helps to increase visibility in thick brush. These tongs measure 52 inches in length and are constructed with a high-quality aluminum pole that houses the stainless steel cable. The grip of the tongs is designed to conform to your fingers while the spring mechanism is made to provide fluid motion and control. The aluminum jaw uses the Pilstrom design. However, it’s slightly tweaked to create a wide opening. This opening can accommodate larger snakes and helps you to control pressure. It achieves maximum grip without causing harm to the snake. The spring-loaded jaw can help you achieve precise pressure controls for safe and secure relocation. 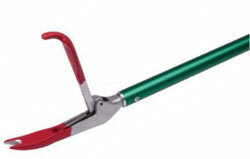 At 47 inches long, these tongs from IC ICLOVER can be used on a wide variety of snakes. The entire tool is made of steel, including a strong tube pole that’s 19 millimeters thick. The spring and cable system is safely contained inside this tube. The grip is contoured and covered with a smooth rubber coating to improve comfort and control. The jaws on this option are unique and effective. They have a thinner scissor-style construction. However, the top jaw is serrated. This design enhances grip and prevents movement while remaining safe on the snake. The bottom jaw is contoured to ensure that the snake can’t wriggle out. Tongs come in a variety of different styles. While they all serve the same purpose, slight differences in design can make snake extraction and removal a bit easier and safer to do. When choosing a grabber, it’s important to consider the intended uses of the tool and the specific snake species you’re targeting. The average user looking to safely relocate a snake in their backyard may automatically think that longer tongs are always better. Unfortunately, that’s not always the case. Sure, increased length keeps the snake a bit further, decreasing the chances of a strike. However, longer poles are more difficult to control. The longer a grabber is, the harder it will be to lift the snake. 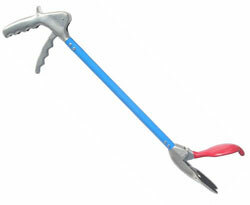 The point of snake tongs is to use the tool to lift the snake with one hand. Most longer tongs will need a second hand for support, putting the user at risk for injury. These tools can range in size from 24 inches in length up to 72 inches. If you plan on using the tongs on a variety of different species, it’s good to meet somewhere in the middle. Typically, 40-inch tongs will suffice for handling most snakes. Shorter options will provide more control. If the snake is heavier, such as a rattlesnake, this control and support will prove to be beneficial. 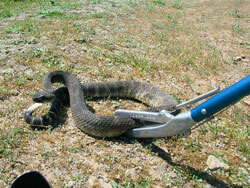 Longer tongs are great for removing snakes that are hidden in the brush. They make it possible to reach into areas without any risk. If you’re hiking in the wilderness, an option around 50 inches is a good compromise. The style of the jaws can affect what the snake feels. When handling these creatures, it’s important to keep them calm. Pain and discomfort will only agitate them further and make them strike. Some jaws can cause injuries to the snake by harming their spine, so it’s important to choose jaws based on the species. There are a couple basic styles of jaws available. Pilstrom-style jaws are narrow and generally used for lighter snakes and basic handling. 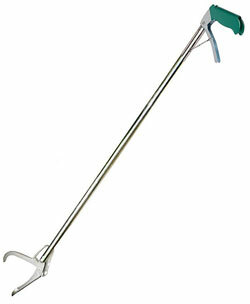 Many professionals also use these tongs for dragging the snake or moving items in the cage. The jaw has a unique mechanism that acts like a pair of scissors. The top jaw is small and fits into a groove in the bottom jaw. This mechanism can cause harm to the snake. The thin design puts pressure on a single point on their bodies and inexperienced handlers can squeeze the jaw too tight. The cable that controls the jaw is also exposed, which can ultimately snag on trees and brush in the wilderness. Gentle Giant jaws are great for handling larger snakes and keeping them comfortable. They are considerably wider than the previous option, increasing the overall surface area that makes contact with the snake. The spring and cable mechanism are also encased into the support pole to prevent snags and damage. When lifted, the wide jaw reduces stress on the spine and provides more control. On the downside, tongs with this style of jaw are a bit heftier. They are difficult to get into tight spaces and can be quite cumbersome when hiking. Other jaw styles are also available. Some models combine the best of these basic styles to create tongs that are safe on the snake and very easy to use. They feature medium-sized jaws or those with a bit of padding to increase the overall surface area without creating too much bulk. If you’re new to handling snakes with tongs, it’s important to exercise caution. Snake tongs are fairly simple to operate. The jaws are manipulated using the mechanism on the handle. From there, it’s all about technique. Before facing the snake head on, it’s imperative that you gather all of the right gear to make the process as smooth as possible. In addition to your handy snake tong, a secure container is needed. The container should be large enough to accommodate the snake comfortably and secure enough to prevent escape. Stick to containers with screw-top or locking lids. 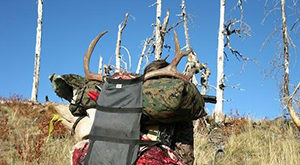 Large buckets with lids are a great option. Coolers and open containers should be avoided, as they make you vulnerable to attack. Make some holes in the container so that the snake has fresh air, but make sure that fingers stay away once the snake is in there. A snake hook is also recommended. This tool is like a tong but contains only a single hook that can be used to control the snake. Hooks should be at least 40 inches long to match the length of the tongs. These are versatile tools that can be used to hold down the snake for a brief period of time while you position the tongs or support the snake’s body weight during the move to a container. Once you’ve found the snake and have the supplies ready, use the tongs to grip the snake’s body on the upper third of its body. Never use the tongs directly on the neck behind the head. Not only will this agitate the creature, but it can harm their delicate spine. If you happen to grab the snake near the tail, use the hook to control the head as you move the tongs up. Use the hook to lift the lower third of the snake’s body simultaneously with the tongs and place it in the container. Tongs should only be used to lift the snake for a few moments. The longer you hold the snake off the ground, the more stress you’re putting on the spine. Make sure to use a gentle yet firm grip. Holding too tight can make the snake more aggressive. With the right tongs, you can take control of a pesky snake and move it to an area that’s safe. Whether it’s a wild snake or one that’s already contained, these tools ensure that you stay in control. They can be the difference between a comfortable move and a painful strike.